I loves me some rhubarb. We had a bunch of fresh rhubarb from Camilla’s garden and I’d been happily consuming rhubarb muffins. 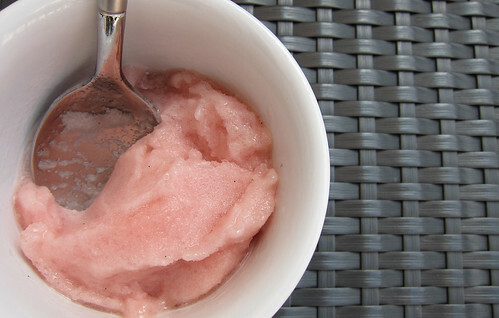 We were getting ready to go away for a little vacation though and I wanted to save all that lovely rhubarb, so I did a little poking around and decided that turning it into sorbet would be a perfect little treat that keeps well. I was gleefully shoveling some of it in my mouth the other day and tweeting about it (because, well, I tweet everything). Some folks asked for the recipe, so I’ve finally gotten the time to sit down and translate it. This is another recipe from Claus Meyer’s Almanak cookbook, so the original is in Danish. Cut the top off and trim the bottom of the rhubarb – remember to take care not to take off too much of the base, which is the bottom, white piece of stem and where the taste is most concentrated. Wash the rhubarb stalks and cut them into large pieces. Split the vanilla bean in half lengthwise and scrape the seeds out. Bring to a boil and let it boil for 3-4 minutes. Turn off the heat and add vinegar to taste. Let the rhubarb sit for 20 minutes, then remove the vanilla pod and the peppercorns. Blend the rhubarb and pass the mixture through a coarse sieve, so that a little of the rhubarb pulp comes through. Place the mixture in the refrigerator and let it cool completely. Once cool, put it in an ice cream machine to make the sorbet. Put the finished sorbet in a plastic container and place in the freezer. The sorbet should keep its consistency in the freezer for 3-4 days. After that or if your sorbet comes out of the freezer with big ice crystals or very hard, you can revive it by melting it and putting it back through the ice cream machine. If you don’t have an ice cream machine, you can instead put the mixture directly into a plastic container and freeze it. Once the sorbet is completely frozen, turn it out onto a cutting board and chop it up into big pieces. Put the pieces in a food processor or blender and blend until smooth. Set it back in the freezer. Mix the sorbet every 30 minutes for 1-2 hours to maintain the creamy consistency.